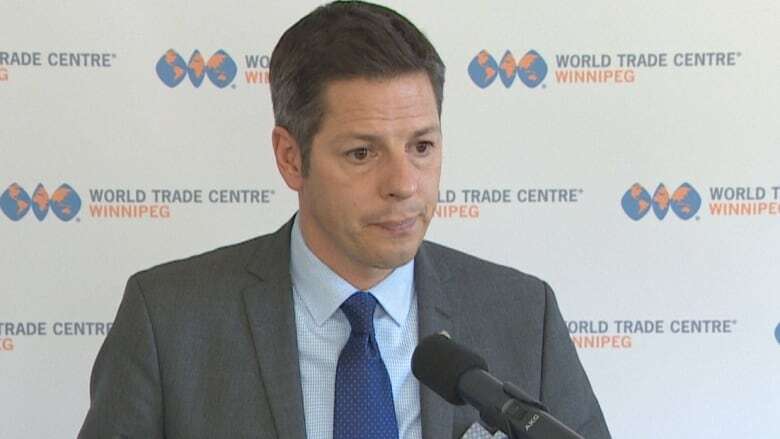 Mayoral candidate Brian Bowman wants to create a list of city bylaws and regulations council could update or eliminate to improve business in Winnipeg. Bowman, who is running for re-election, pledged Friday to direct city public-engagement staff to speak to businesses to come up with a "top 10 list" of outmoded rules. He suggested city bylaws governing signs could wind up under the microscope. "I think there's areas for improvement. Could be eliminations, could be improvements, and that's one off the top of my head," Bowman said at the old city hall in St. Boniface. Bowman also reiterated his pledge to eliminate the city's business tax but could not say when that will happen other than that tax will continue to be phased out in small increments every year. The city plans to collect $56.9 million in business-tax revenue this year, down from $57.5 million in 2017, city budget documents say. Mayoral candidate Jenny Motkaluk tried to further elucidate her property tax plan, gathering reporters at her Ness Avenue campaign headquarters for the second day in a row. On Friday, she pledged to ensure all Winnipeg owner-occupied residential properties will be handed property tax hikes of 1.16 per cent in what would amount to a change in the way tax bills are calculated. Right now, Winnipeg hikes the total amount of revenue it collects from all properties, but individual property-tax bills vary above and below that hike, based on their relative assessments. Motkaluk said she would use a rebate mechanism to ensure no property would receive a hike above 1.16 per cent and cited a legal means of doing so under the city charter. It remains unclear how the city would have the legal authority to increase a property tax bill for a property that would have received a hike of less than 1.16 per cent, based on its assessment relative to other properties. Mayoral candidate Don Woodstock pledged to freeze property taxes for four years and force departments to find a way to cover incremental cost increases. Woodstock also pledged to eliminate growth fees.